The most common cause of artificial joint failure is loosening of the prosthetic implant. 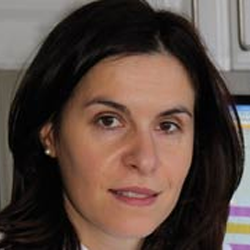 Dr Athina Markaki is designing materials to anchor them securely. The innovative concept here is that mechanical strain is generated in the bone by applying a magnetic field. Prosthetic implants provide long-term pain relief for many millions of people worldwide – in the UK alone, 160,000 hip and knee replacement operations were carried out in 2009 – and, as people live longer, the demand will continue to grow. Typical lifetimes of artificial joints are only about 10–15 years, with the most common cause of failure being loosening of the prosthesis stem from where it embeds into the bone. Once a joint becomes loose, wear debris tends to form and cause damage. Therefore, ensuring that the bond between bone and implant remains strong is an important objective. An innovative solution that is being investigated by Dr Athina Markaki in the Department of Engineering may provide an answer. The aim is to promote early bone ingrowth into the surface of the prosthesis and anchor it securely. Bone is an active material, responding to stresses and strains within. It’s long been known that mechanical strain, such as occurs during exercise, encourages bone modelling (formation) and remodelling (resorption). In fact, this forms the basis of the physiotherapeutic exercise commonly applied after implantation. However, in cases where the patient requires complete immobilisation, such treatments are clearly impossible, and drugs are often the only alternative. If a therapy could be devised in which controlled levels of mechanical strain are induced directly within ingrowing bone via the prosthesis itself, this would improve the bonding between prosthesis and bone, and avoid the danger of loosening caused by premature excessive exercise. Dr Markaki’s project focuses on a novel concept called magneto-mechanical actuation, which arose from work she carried out with Professor Bill Clyne at the Department of Materials Science and Metallurgy in Cambridge, funded by the Cambridge-MIT Institute. It involves a porous surface layer made of ferromagnetic fibres that is attached to a conventional prosthesis and promotes ingrowth of bone so as to anchor it more fully and rapidly. Porous metal implants are not new. The innovative concept here is that mechanical strain is generated in the bone by applying a magnetic field. This causes the network of ferromagnetic fibres to move so as to align with the field, imposing strains on bone cells as they grow into the network. Modelling of the phenomenon has shown that the degree of strain is determined by the geometry of the network – in other words, the prosthesis can be coated with material that is tailor-made to impart the optimum strain on ingrowing bone to promote growth. Once the optimum exposure regimes have been established, the idea is to apply a magnetic field during the postoperative period to the region of the implant. The strength of the field would be lower than that currently used for diagnostic purposes, such as in magnetic resonance imaging, but would be sufficient to cause the fibres to move. Thanks to a recent award of a €1.5 million European Research Council Starting Investigator grant, Dr Markaki has embarked on a five-year programme to progress this concept to application. The work will be carried out in close collaboration with Dr Roger Brooks at Cambridge’s Department of Surgery (Orthopaedic Research Unit). The hope is that the technique will yield a new generation of longer-lasting and more durable prosthetic implants, reducing the painful and costly need for replacements. For more information, please contact Dr Athina Markaki (am253@cam.ac.uk) at the Department of Engineering.